Adobe adds Allegorithmic apps to the CC toolbox. Allegorithmic, the creator of Substance and the leader in 3D editing and authoring for gaming, entertainment and post-production, has been acquired by Adobe today. The move means that Creative Cloud will now be home to the 3D design tools that made Substance the industry standard for 3D textures and material creation. 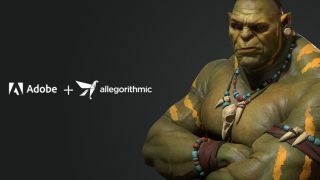 Adobe hopes that by combining Allegorithmic's tools with its own, it will empower video game creators and VFX artists working across film and television to create amazing 3D art. The decision is also a huge step for Adobe in terms of expanding the reach of Creative Cloud's 3D and immersive workflows. "We are seeing an increasing appetite from customers to leverage 3D technology across media, entertainment, retail and marketing to design and deliver fully immersive experiences," said Scott Belsky, chief product officer and executive vice president at Creative Cloud. "Creative Cloud is the creativity platform for all and Substance products are a natural complement to existing Creative Cloud apps that are used in the creation of immersive content, including Photoshop, Dimension, After Effects and Project Aero." Users will be in good company. Allegorithmic's previous customer base includes huge brands such as Electronic Arts, Ubisoft, BMW and Ikea to name but a few. "Allegorithmic and Adobe share the same passion for bringing inspiring technologies to creators," says Sebastien Deguy, CEO and founder, Allegorithmic. "We are excited to join the team, bring together the strength of Allegorithmic's industry-leading tools with the Creative Cloud platform and transform the way businesses create powerful, interactive content and experiences." Currently Allegorithmic tools are available with monthly or annual plans. However Adobe has said that it will 'focus on expanding the availability of of Allegorithmic tools via subscription." This is where the headaches could set in for 3D artists who are not fans of being tied down to a subscription. While Substance availability could stay as it is for the short term, a decision to bring it in line with Creative Cloud would be cause for concern for 3D artists who are already paying a fortune each month for tools such as Maya.